Crimson was deliberately chosen by the Editorial Group as the colour for this journal as it represents, for us, imagination, intuition, potentiality, struggle and transformation. Designed for this journal by artist, Sam Rolleston: The central Koru indicates growth, activity and action. The mirrored lateral Koru branches indicate reflection. Transformation is shown by the change of the initial plain Koru design to a more elaborate one. 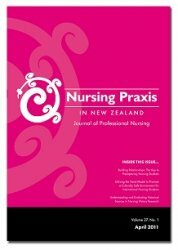 First published in November 1985, Nursing Praxis in New Zealand, the first nursing journal in NZ continues it’s long history as New Zealand's regularly published peer reviewed nursing journal. Publishing a diverse range of articles related to practice-based research and professional discussion, the November 2011 edition marked 26 years for this quality nursing journal. Highly valued by individuals and institutions worldwide, it is a first point of reference for the NZ nursing sector across the range of practice, research and education areas, and is highly regarded internationally especially for it’s history of cultural safety focused articles. Nursing Praxis was revamped in 2010 with a new A4 size, new format and a new attitude, with articles ranging from research to professional comment, as well as personal experience stories, book reviews, conference and events reports. The new format enables easy full page advertising options for sponsors & advertisers at A4 (full page) or A5 size (half page). Existing subscribers will automatically receive full access to the full text database of articles. Short term subscription allowing online access to full text articles for a week or month. Searching the database of articles and issues is easy. View online in e-journal format for computers/e-readers/ipads. Print articles from PDF for your own personal use (All articles are copyright protected). Nursing Praxis has a distribution going to nurses, health managers, institutions and health libraries in NZ and internationally. The Nursing Praxis website is accessed by nurses, educators, health workers , managers and undergraduate and postgraduate nursing students both locally and internationally. Regular editions are distributed 3 times a year - March, July and November. In addition special editions in e-journal format are published from time to time. For Email notifications of new issues and news updates subscribe free to our blog.